Atomic clocks are some of the most important measuring devices on Earth, as they are used for master clocks that essentially dictate the time standard used pretty much everywhere. See the time on your computer or smartphone? That has almost certainly been synchronized with an atomic clock in the past day or so. 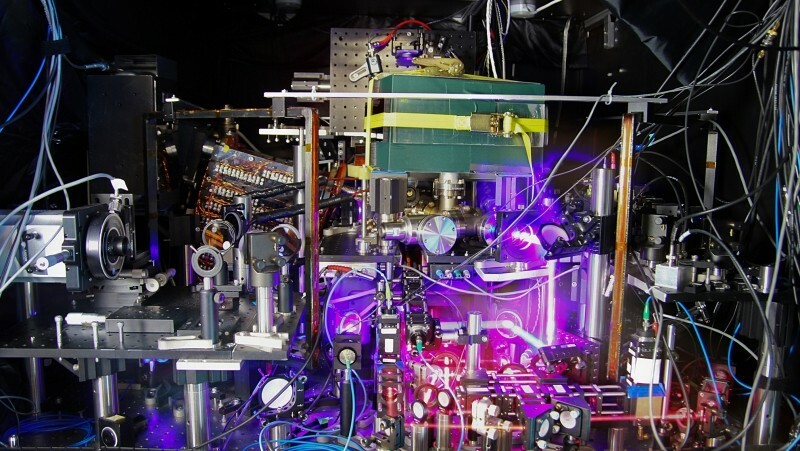 While atomic clocks are already unbelievably accurate, a new atomic clock has been developed by JILA researchers that has set a world record for accuracy and stability. This new clock is a factor of three more accurate than the previous world record holder, meaning that it won't lose or gain more than a second after 15 billion years of operation. In other words, this clock could continue to "tick" for longer than the current age of the universe, and it would barely lose any time at all. The way this atomic clock works is rather complicated. Inside the clock mechanism, an optical lattice is formed by strong lasers, which hold a bunch of strontium atoms in place. A red laser then forces these atoms to switch between different energy levels, and each switch corresponds to the tick of a clock. This new record-breaking atomic clock managed to improve upon accuracy and stability by using a new and much more stable laser, more precise control over the clock's temperature, and improved measurement techniques. The clock is now so sensitive that it's affected by changes in gravity: moving the clock up in height by just 2cm would affect its output. The researchers hope that this clock can not just be used to keep ultra-accurate time, but also to conduct further research into quantum behavior and gravity variations.